Fusion food is a fairly common trend in Korea – essentially meaning taking different cultural cuisines and fusing them together with Korean food. While some people enjoy these novel concoctions, being labeled as fusion is usually a pretty good indicator of yucky food in my opinion. To me, it often seems to be taking some Korean food and drowning it in cheese, ketchup, or gravy or otherwise combining tastes not meant to be combined, resulting in mutant freakish concoctions that will chill your soul. Today, I have a recipe for a fusion take on a Korean classic, but fear not loyal readers, I would never lead you astray! This is fusion in its mildest sense – we’re taking the Korean favorite bulgolgi and making it a sandwich. Not scary at all! Honestly, this is super yummy and so convenient for tailgating, or cook-outs. We love it. We originally posted about bulgolgi in our tempeh bulgolgi recipe, and we’re using the same marinade recipe from that. But, when Julia commented about making it with soy curls, we had to check them out, and we are so glad we did. We still have our tempeh bulgolgi, but we ordered Butler soy curls online, and they are really excellent and absorb the marinade flavor so well that they provide the flavor punch you need to taste the marinade over the bread. 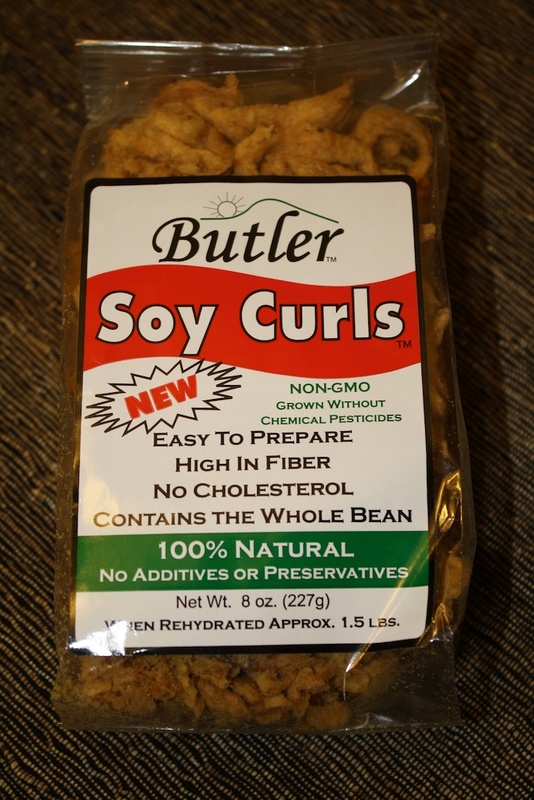 We previously tried a version of soy curls at Loving Huts in Korea but still haven’t found these anywhere in the Indianapolis area so we ordered Butler soy curls from Spencer’s Market. 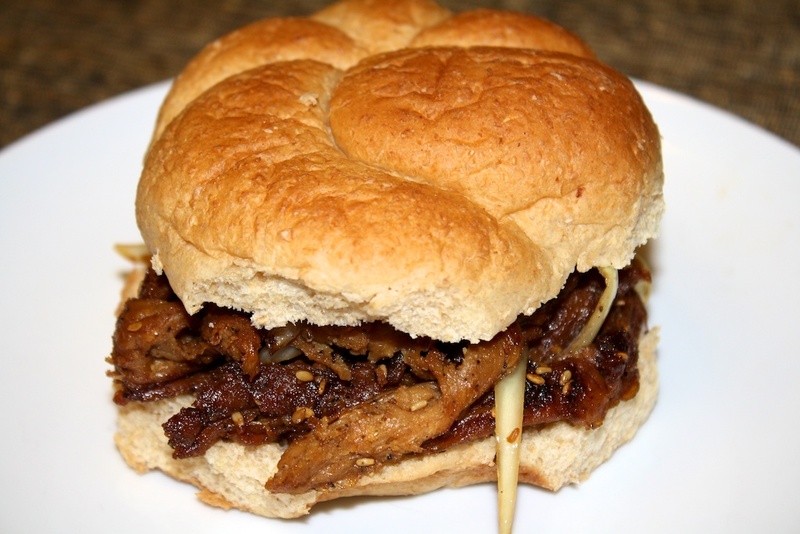 This is super quick and easy to make, and like any sandwich, you can dress it up as you like. We like it with vegan mayonnaise and red leaf lettuce, but you can also add vegan cheese or any other sandwich toppings you like. Prepare soy curls as per the package directions. For Butler soy curls, this means soaking the curls in warm water for 10 minutes to rehydrate them. Combine all of the marinade ingredients into a large bowl. Squeeze out water from soy curls. You don’t have to get out every drop, but you want to get most of it out – just give a couple of quick squeezes with your hands, being careful not to squeeze so hard that you mush the curls. 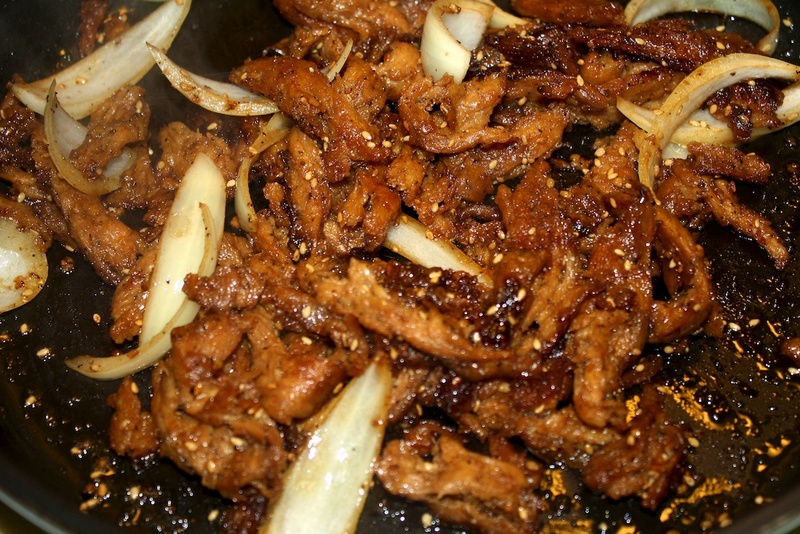 Add the sliced onion and soy curls to the marinade and stir to coat the well. Heat 1 Tbs of oil in a skillet over medium-high heat and pour in curls, onion slices, and marinade and cook for approximately 5 minutes until curls and onions are browned and marinade thickens. Toast buns (and melt cheese while toasting if using), spread vegan mayonnaise on buns to taste, divide bulgolgi mixture on buns, top with lettuce and any other toppings, and enjoy! As you cook the curls, they will brown and the marinade will carmelize, creating a coating for the bulgolgi mixture. The bulgolgi mixture also makes a great banchan as part of a larger spread. I had this at the ThanksVegan event tonight. I really enjoyed it…thanks! Hi, Scott! We had a great time at the event. So much yummy food! Checked out your blog and loved the story of your first run! What 6 year old runs 3.1 miles?! Thanks for visiting and so glad you enjoyed the bulgolgi! Please come to Toronto and visit us at our new Macrobiotic Centre of Toronto! We will recruit you to help us put on a vegan Korean feast! Oh my gosh! This would be perfect to bring to a Korean potluck that my class may be having. I’ve used bulgogi marinade on TVP I’ve used for kimbap and jajpchae, but the soy curls look even better and I bet would work great for wraps. Thanks! 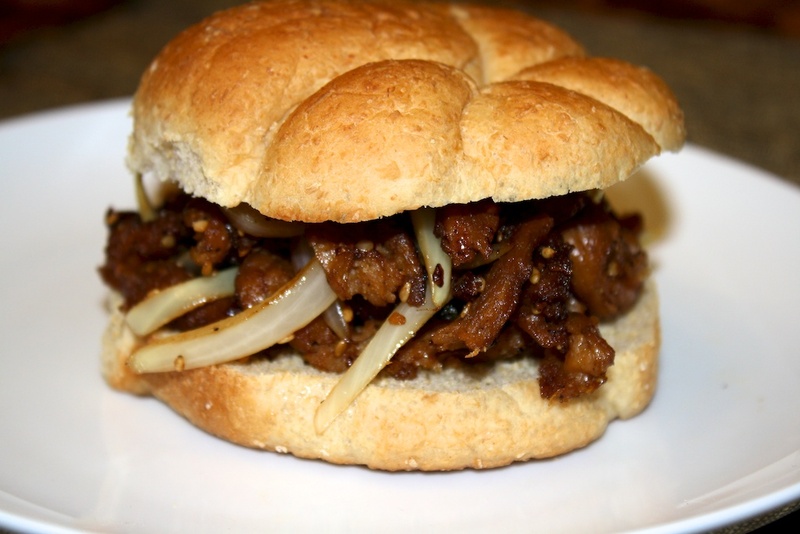 I use to make marinated beef sliders similar to this. This would be awesome. I would add some cabbage or sliced cucumber kimchi to mine. Got to try this!! This recipe is awesome. Thank you for sharing. I was following a regular bulgogi recipe and the flavor always came out bland, and the texture came out soggy. But I finally got a crispy glaze with yours + flavor! Could mushroom sub the soy curls? I would love to try this, but I cannot have soy. 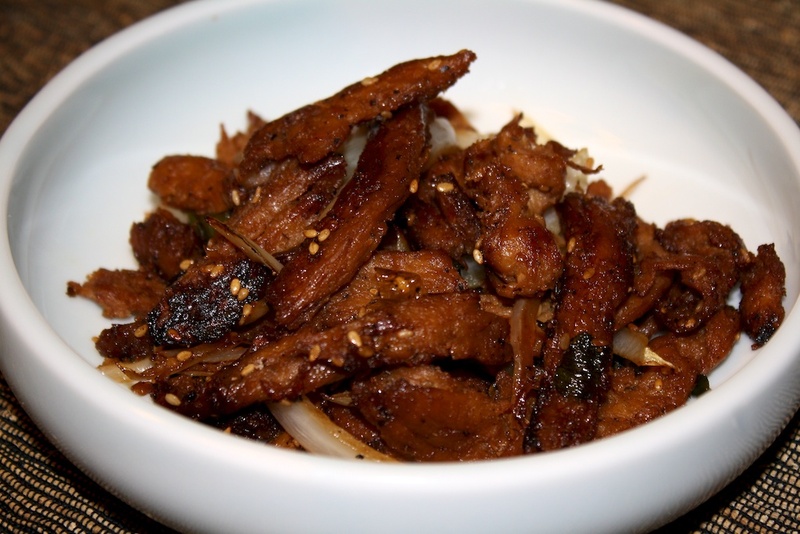 Yes, we have a bulgogi mushroom recipe you could try – check the site! I’d say you could also sub shredded seitan.